Sometimes, even when it ain’t broke, the Airwolf 3D Wolfpack still fixes it. 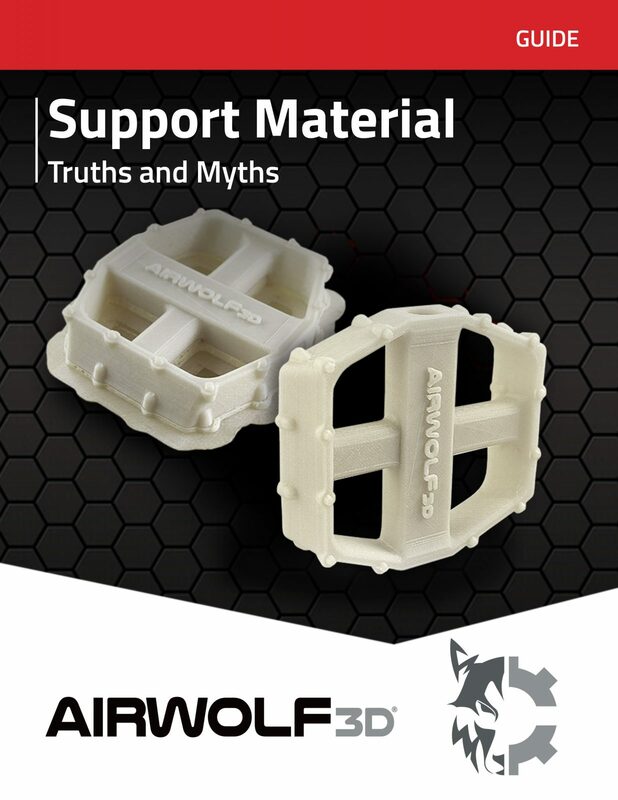 That’s why, despite this dissolvable filament’s success and effectiveness, Airwolf 3D’s patent-pending HydroFill Water-Soluble Support has undergone a few tweaks and has now been reformulated to work better than ever and offers support to more materials than PVA filament. Airwolf 3D strives to create green 3D printing alternatives and, like many of our products, HydroFill is also a “green chemistry” solution that is safe for the environment. While the new formula isn’t radically different from the old one, you will notice an overall increase in the quality and performance of the material. The world’s only true water-dissolvable support material for large parts is now even more stable at higher temperatures and exhibits greater accuracy and structural integrity with very intricate prints. The biggest change is that HydroFill is now certified compatible with a wider range of materials. When we originally released HydroFill, we advertised it as support material that was only compatible with ABS and PLA. Those were the materials that we thoroughly tested and were completely confident worked beautifully when printing large parts with HydroFill. However, it’s no secret that, with the Airwolf 3D Wolfpack’s obsession with continual innovation and improvement, we tinker with, break, and fix just about anything we come across — especially our own products. 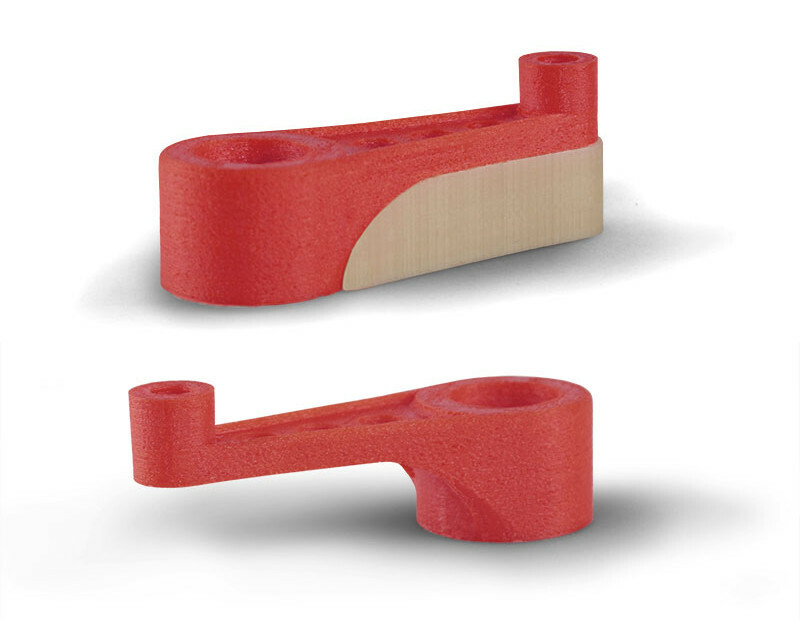 Before and after: HydroFill provides support for a wider range of materials, making it easy to 3D print parts with steep angles and overhangs. Over the last year, we have continued to test HydroFill with different machines, various materials, and a myriad of 3D models. We tried and tested a number of slight changes to the original formula as well — and, no, it still does not contain PVA. We are often asked, “Isn’t HydroFill just PVA filament?” PVA (polyvinyl alcohol) is another water-soluble support material for multi-extrusion 3D printing, however, it does not support ABS and other materials. While HydroFill is a fully proprietary formula whose details we rarely discuss, we guarantee that it is not PVA nor is there any PVA in the formula. It’s easy to prove this. Simply print a large ABS part with HydroFill to see for yourself. There is no way that PVA filament can stand up to the heat and weight of jumbo ABS overhangs. We did, however, make some small changes to the HydroFill formula after extensive testing and we are excited to announce that HydroFill is now certified compatible with more materials. In addition to ABS and PLA, HydroFill is now formulated to support most nylons on the market, including 910 Alloy, CARBONITE Nylon, and (spoiler alert) a new high-performance nylon coming soon from Airwolf 3D. While the new HydroFill formula is also compatible with most flexible materials, we are still testing TPU and TPE for full compatibility certification. With HydroFill’s new and improved formula, it’s even easy to print large, complex parts out of ABS, PLA, and nylon. In addition to wider material compatibility and enhanced performance for complex prints with long print times, the new HydroFill is less sensitive to moisture and more forgiving in terms of how it is stored — but that doesn’t mean you should make a habit of leaving it exposed on your workbench. For best results, always store HydroFill in a sealed plastic bag with a desiccant. 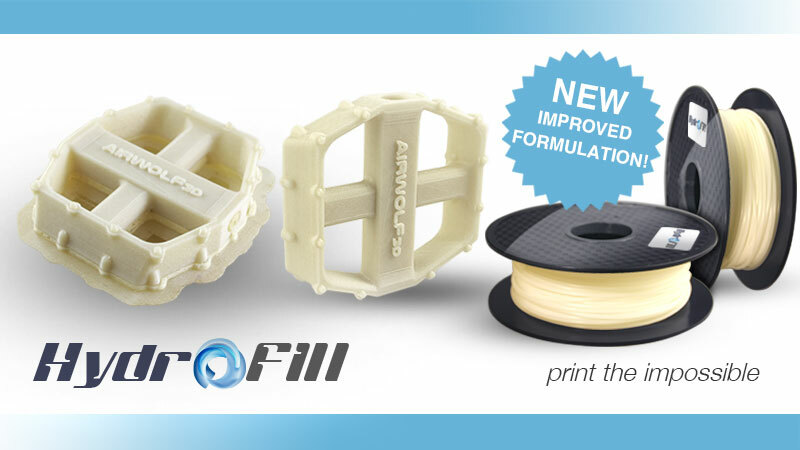 Due to popular demand, the new and improved HydroFill Water-Soluble Support now also comes in new sizes. In addition to the original 1lb spool, you now can purchase HydroFill in 2.2lb and 5lb spools. So go big and 3D print the impossible! Download our white paper "Support Material, Truths and Myths"